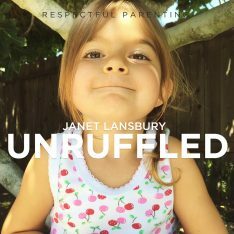 Hi, this is Janet Lansbury. 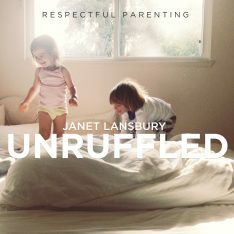 Welcome to Unruffled. Today I’m going to be replying to a parent, who feels that she needs a drastic change in her parenting approach because she has a two-year-old, who resists her attempts to set limits. And she says she’s suffering as a result, and she doesn’t know what to do. “Hi, Janet. Thank you so much for all the work you do. I have a question. I feel like I am missing a step or steps. I have hit rock bottom. I have realized that I’ve been forgetting myself and suffered because I don’t have boundaries. I have always been the one helping, supporting everyone else to the detriment of myself. And now, my two-year-old is making it very clear that I need a drastic change if I want our relationship to be a two-way street. I have read your book, articles, et cetera, but I cannot find the answer to my question. I don’t get what I’m supposed to do once I have set the limit and acknowledged his feelings when he reacts. Then what? For example, I had to work in the kitchen at the computer. I told him, “I’m going to work now. I will close the gate.” I have a gate that separates the kitchen and living room. He right away started to cry and mumble angrily. I told him, “I hear you. You want to play with me and you are upset that I cannot play with you at this moment.” Then he continued for an hour and still going while I am typing this. What I am missing is, what am I supposed to do during all this time? Okay, so I’m glad that this parent prefaced all of this by admitting that she has a very hard time with personal boundaries. She’s not in the practice of setting them for herself. It sounds like her son is come into her life to teach her how to do this, as children do. I’ve had a similar experience with my oldest daughter, where I really needed to learn how to assert myself, and to accept that I’m not going to make people happy all the time with what I need to do. And that that really has to be okay with me, even if it’s my child. Maybe especially if it’s my child, because our children are looking to us to be their leaders, to be in a relationship with us between two people, where both have needs. And the child’s needs or the child’s wants, I should say, don’t always trump the parent’s needs. Now it sounds like this parent is expecting that she’s going to go from zero to 10 here. She has difficulty setting any boundaries and disappointing her child, and now she’s wanting to zoom to the hardest thing for any child, which is to accept that their parent is right there near them, and sucked into something else, which our computers do. They do draw us in deeply. That’s going to be hard thing to pull off with any parent and child dyad. It’s just going to be difficult for children to have you there and you’re so engaged in a computer. And for us to be able to concentrate when our child is distracted by our presence. So we’ll talk a little about addressing that situation. But first, I want to go over a little bit about how to approach setting boundaries. The first thing I would do is take a look at why she doesn’t like to set boundaries with people. Often, in this there’s some element of the way we were raised. But when it comes down to it, it’s usually because we don’t feel comfortable when others are not pleased with us. That we are much more comfortable with having that constant validation that we’re making other people happy. And that becomes more important than taking care of our own needs, self-care, and doing things that make us feel happy. The problem with that is that it does create resentments, which are really our fault. They’re the fault of the person that isn’t setting the boundaries and is allowing the other person to walk over them in some ways. And now, I’m going to be angry with you. That’s going to interfere with our relationship. We don’t want that to happen with our children. And that’s really where I had to come to, personally, with this. What does it mean to love someone? Does it mean to try to keep them happy all the time, never have them being in any kind of conflict with us? Or, is it to really, purely care for that person, and understand that life isn’t about being content every moment. That it’s about feeling a wide range of emotions and being in conflict with other people sometimes in our needs and our wishes. I had to realize that loving my child meant not just doing the easy stuff, laughing, and playing, and snuggling, and kissing, and hugging. But doing the hard stuff. Saying no. Being yelled at. Worrying that maybe I was damaging my child by allowing them to express their feelings. That I needed to fix them somehow. That it wasn’t safe to have my child upset with me. That something permanent was going to happen in our relationship. They weren’t going to like me anymore, they would abandon me, something. All of those fears we have to look at, and make peace with, and see as our own stuff. That really our child deserves to have the healthiest outlook, and resilience, and that means sometimes you get just what you want in that moment. And other times, you don’t. You always get what you need, but you don’t always get what you want. Now there are some advisors that will say, “This is a message that children aren’t ready to get until they’re whatever age.” But in truth, it’s much harder for us and for our child to have to switch into a different mode, rather than beginning that way at the start. And that’s why Magda Gerber suggested that even with your infant. If they need you, but you’re right in the middle of pouring that cup of tea for yourself, and you just need one sip before you go to them, you do that. And then come back to your child, “Oh, I heard you and I’m sorry I couldn’t be there right when you wanted me. I’m here now.” Not feeling guilty, not feeling that we’ve done something wrong, or that is unsafe in any way. Feeling really positive about those interactions. We’re not trying to make them happen. We’re not trying to make our child upset ever. But through the normal self-care routines that we have, and taking care of the house, and getting food prepared for our children, and all of those things that leaders have to do in the house, we will be disappointing our child a lot of the time. We’ll be causing them to be unhappy with our decision. This is a dynamic that is much easier and healthier for parents and children if it begins as early as possible. But we can also find it at any time, and switch gears, and our children will switch gears right along with us. Generally, with parenting, children adapt very easily. Parents, not so much. It’s harder for us to change the way we perceive our role, the way we perceive our child and their feelings, and to change the patterns and the dynamic that have gone on between us. Children will shift immediately, but we have to shift first, and that’s the hardest part. So all of that said, the type of interaction she’s having with her child here is something that I do go over in a very recent post that she may not have read. It’s called Separating With Confidence From Your Clingy Child. And it’s just a very brief back and forth message exchange that I had with a parent about this very thing, actually. Her child was a little younger. I think he was only 14 months, and she wanted to do her housework, and he would just follow her around, and be crying, a really sad look on his face, and just not able to let go of her. What I recommend in that post, well, if anybody’s interested, they should probably just read it. But I recommend perceiving this as a healthy interaction between you, wonderful messages that we can give children here, that we hear their strong feelings, and that we want to hear that from our child. We want to know what they feel about things. It doesn’t change the choices that we make as the leader, as the person who’s mature, and knows that this, this, and this have to happen for our life to go on in a healthy direction. Children can’t know that. They need somebody who does and that’s us. To be in what I call disagreement with children is very, very healthy. It teaches them that it’s safe to be in disagreement and love goes on. In fact, even in that disagreement, there’s a lot of love and connection. Connection isn’t just this positive, happy thing that you have. Connection is being honest and being able to be in conflict, and be able to hear someone’s unhappy feelings. Even if they’re about us. Especially if they’re about us. Wouldn’t it be so much easier if we set the limit, we acknowledged our child’s feelings, “You didn’t like that I did this.” And then they turned around, they got it, and that was that. That’s over. Now everything’s fine. That would be nice. But I believe children unconsciously use these experiences as a channel for the other strong emotions that they have. It’s like they open up that spout of the tea kettle and out pours all the steam that’s inside them. It’s not just about that we said we can’t play with you right this minute, or that we can’t give you attention right this minute, or that we have to go to the bathroom, or that you got the red cup and you wanted the blue cup. It’s not about cups, it’s not about that they need our attention every moment. No one needs another person’s attention every moment. Children would like our attention every moment, and they want to explore that, but that doesn’t mean that they need it. Yes, they do need periodically our undivided attention. “I’m really happy to be with you in this moment and there’s nothing else I would rather do,” kind of attention that children do need. That I think we all need. But not all the time. So what children actually do, after we acknowledge feelings or after we set the limit, they will release. They will object, and in that objection they’re releasing other feelings. And even if we don’t believe that, even if we think they’re just objecting to that particular thing, it needs to be seen as a strong objection. That’s how we see another real person there. Not a person that’s completely weak, and has no life at all beyond us, but an actual three-dimensional person that is capable of feeling emotions, that’s capable of occupying themselves. So it’s not that this child isn’t capable. It’s just that he’s having a hard time letting go. And oftentimes, that’s because we don’t have complete conviction in what we’re doing. And if this parent has struggled her whole life with boundaries, it’s very likely that she’s not going to have enough conviction to make a choice like this, where she’s going to be working in her child’s view. But what I would do in this or any situation is set the limit. “This is what I’m going to do. I’m going to close the gate.” I love that she said all that. So I would immediately respond to that verbally. “Oh, I hear you. You really don’t want me to go right now.” I would try to avoid adding on anything else like, “It’s going to be okay. Here’s some toys to play with.” I would really allow that feeling to be heard. “You’re saying no to me doing this. I hear that.” I would definitely not expect to be working for more than, I don’t know, 15 minutes at a time. Especially when she’s first establishing boundaries. In fact, I would probably practice doing this for much smaller periods and activities. Like, “I’m going to the bathroom.” Then he still cries and mumbles angrily. “Wow, sounds like you really don’t want me to go right now. I hear that.” Then you go, you come back. Oftentimes, children will yell at you more when you come back than they will when you’re leaving, which I find interesting. It’s like, “Hey, I didn’t give you permission to go and do that. How dare you go away from me.” It’s much stronger than it can appear. And I think it’s important to see it that way, for our child and for us. To be able to set the limit, we need to see our child is strong and our child needs to be perceived as strong, to be able to feel capable in their world, in these age appropriate situations. So walk away, come back, and if you get blasted when you come back, “Oh, you really weren’t okay with me leaving. 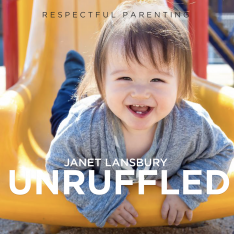 That was not what you wanted.” Something that’s connected, something that’s empathetic, where we’re really willing to see and meet our child’s feelings at full force, and we’re not intimidated by it in any way. We see it as positive, we see it as this really positive exchange we’ve just had. So I don’t know how this went on for an hour, if she actually tried to work for an hour. I would not do that. I think that’s an expectation that’s not very reasonable. With a toddler, it’s probably not going to happen. So I would plan those long periods of work for when your child is asleep, when your child is taking a nap. As my mother always used to say to me when she would call me during my children’s naps. She’d say, “Well, I’m going to be quick because I know this is prime time.” And it was, it was prime time for me to get some things done, to rest, to catch up a little bit, and not feel that everything I did meant setting a boundary with someone. It’s hard. I mean, we’re not going to be able to do it all day long, and we’re not going to be able to do it for an hour. But for the whole time my child was doing it, if it was the whole 10 to 15 minutes that I was going to take to do a couple of emails, or whatever I had to do, every minute or so, I would turn my head. I’d say, “Wow, I hear you. You’re still going. You’re still telling me off.” And that’s all. Having that conviction inside though, that’s the most important thing. The words don’t matter, the actions don’t even matter as much as how we feel inside about holding ourself as a leader, having those boundaries, feeling good about ourselves. That’s the challenge for this parent, and for a lot of us. And that’s what I would really work on, reframing love as being a whole person in a relationship with your child. That’s teaching your child about other people and other relationships, with everything you do. You’re teaching your child that other people have boundaries, and loved ones aren’t at your beck and call every second, and aren’t afraid of your feelings. That loved ones know that your feelings are the healthiest thing anytime, anywhere that you express them. That it’s the best thing you could be doing in that moment. And that if there’s a huge overreaction, then there’s a reason. There’s a build up and this is a healthy release. So she says, “What am I supposed to do during this time?” And that’s what I would do. Every minute or so acknowledge that it’s still going on, from a place of comfort in your decision. ​I had another parent that I just talked to who is a nutritionist, and to her, it’s very clear that she’s not going to give her child sweets and that she’s not going to give her child dessert, but she has difficulty with other kinds of boundaries. You have to have that same assurance with everything you do. You’ll find when you step into this one, you believe in it, and when it’s a part of you and you do decide to feel safe doing it or to try to feel safe, you see that it works, it empowers you, it empowers your child, it empowers your relationship, it becomes very clear that this is love. This is, hands-down, one of my very favorite episodes. As a “single married mama” who works from home (my husband lives in another country, and I’m primary parent for our 2 babies under 4), routine + boundaries are the foundation of every single day. I don’t know if it benefits me or my babes more, but either way, it’s the only way! Thanks for this well-defined and supportive reminder. I’ll need it when my high-needs infant has a harder day, and I start to feel off-center. “A place of comfort …” I didn’t realize how uncomfortable I was with myself, because of my unbringing. My mother was harried, to say the least, and did not work out/on her own childhood issues with her mother/parents. In order to understand your articles and podcasts, I have had to do my own inner work. I can’t recommend this book enough: The Body Keeps the Score by Bessel Van Der Kolk. Morning boundaries were hard for me: play once she wakes up, do my thing? I was not in a place of comfort regarding either decision. Then, remembered your example about the Mom who had clear boundaries in other areas: I said, I am going to play with you this one minute and then do my thing. I will play with you when I am done. The thing is, she always hears me when I am in a place of comfort with my decision. “You’ll play with me later?” she asked. Also, Mister Rogers said discipline is teacher/learner. You said it in various posts in various ways, When my daughter sees me be in a place of comfort speaking up for myself, with kindness and love, she learns that she can speak up for herself. I want her strong within herself, happy in her body and happy to see me and happy to be with herself: learning/having boundaries is a surefire way to be all those ways. Thanks Janet. Well said, Maureen, and it’s my absolute pleasure. Sounds like you’ve got this! Thank you so much for this post Janet! This helps me understand my children on so many levels that I just wasn’t even aware of!!! I think a shift in my whole understanding of relating to my kids just happened in reading this article. I calmly stuck to my No decision for my daughter. She threw a fit and my husband and I were calm, finally, because we both study you: we knew we were loving her. Well, I could hear in the tone of her cry that she was over the problem with my decision and then went upstairs for some throw pillows and sat at the top of the stairs with one under her and one on her lap; her arms crossed and chin in arms with angry look. Your stories and comments are always the highlight of my day. Thanks for all your wonderful support and encouragement. This recent experience is a big win for your whole family! 🙂 Thanks again for sharing with me! I appreciate this post a lot, but have a question. The one example in which it was clearest to me was when you mentioned that when we have a newborn sometimes we just “need” to pour our cup of tea and have a sip before picking up our child. To me, having a sip of tea is a want, rather than a need, so I guess I’m asking how we know when our wants come before those of our child. It feels like something we have to continually feel out, but I’m wondering if you have any advice surrounding this issue. Thanks! Thanks, Courtney. A sip of tea in itself may be a “want,” but self-care on the whole is a need. We will obviously put our wants and needs second to our newborn’s the majority of the time. Young children need an incredible amount of care. But as their loving parents and leaders, children need us to be in charge of prioritizing ourselves every once in awhile. They can’t be the ones to decide to give us a break for sip of tea or water. We must take one ourselves, so that we don’t become angry, resentful, unhappy parents. My grandchild is 2.4 yearsrs old.Shortly saying. His Daycare seems a good place to me. But when I pick him up. Half an hour later he is throwing things. He is yelling in a very high voice. Like screeming. Not really to someone. He will be trying to hit the dog. He will try everything he knows he is not aloud to. How can I help him. I think I know what to say to him ‘ I see you are upset. But I have to stop you from doing these things.’ Sometimes he will tell me something what happened at the Daycare. As ‘my friend was chasing me playing he was a monster’ when I ask him, he can even explain he didn’t like that. My question. How can I help him to be not so overwhelmed on the day? Can I do something he will not be so upset after a day at the Daycare? My grandchild is very communicative and an intelligent boy. I hope you can help us too. Hi Jetta! it’s very normal for your grandchildchild to have this response at the end of his busy day at daycare. He’s releasing his stress with his trusted grandmother and that’s a good thing. So what you’re doing is perfect — allowing and acknowledging his feelings, while keeping him safe in his behavior. Hi Jetta! it’s very normal for your grandchild to have this response at the end of his busy day at daycare. He’s releasing his stress with his trusted grandmother and that’s a good thing. So what you’re doing is perfect — allowing and acknowledging his feelings, while keeping him safe in his behavior.